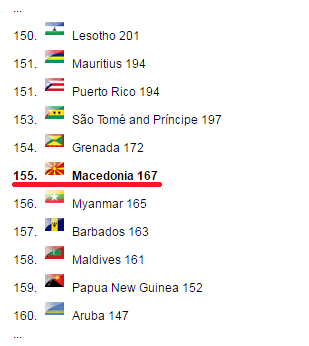 The 155th place is another negative record as it is now the worst ranking in the history of the Macedonian national football team. The home defeats by Israel and Italy in the 2018 FIFA World Cup qualifiers forced Macedonia to fall yet again, reaching the lowest position in its history. If the September's 146th place was the worst since April's 141st, now November will be recorded as the new negative record. Ranked around the likes of Grenada, Myanmar, barbados, Mauritius, Lesotho etc, Macedonia is also one of the worst European teams placed just eight places above the bottom. But before the next rankings to be released, Macedonia risks another historic downfall as must face Spain away in another World Cup qualifier. In the World Cup qualifying group which also includes team Macedonia the best ranked team is Spain (10). Italy is in 13th position, Albania (47), Israel is placed 79th moving up 19 position, while Lichtenstein is in 183rd place. Five years ago, more precisely in June 2011, we were deeply concerned as we fall on the 103th place. Now we are getting closer to the very bottom of the FIFA rankings. FIFA world ranking top 10 includes: Argentina, Germany, Brazil, Belgium, Columbia, Chile, France, Portugal, Uruguay and Spain. FIFA will publish the next ranking on Nov. 24.